Today's favorite nook installment comes from Michelle of Vintage Junky. I was thrilled when Stefanie asked me about my Favorite Nook!  I love Brooklyn Limestone... it was one of the very first blogs that I started following, so I am quite flattered to introduce my little space today. My favorite space is my Studio. My Studio originally started out as my husband's office. Once we had our little boy, there just wasn't enough space for a huge desk and a bunch of toys to keep the boy entertained (my husband works from home and keeps our little guy during the day.) So I coerced my husband to move into a much larger space in our bonus room. Of course, my ulterior motive was to carve out a spot that I could transform into a Studio space that we can craft and paint and contain the mess that eventually trickles downstairs. I also keep my inventory from my etsy shop in this room. I wanted it to be pretty organized since we have some trouble in that department in this house. I also wanted to use as much vintage or repurposed items as possible, like a big cubby system that holds ribbon rolls perfectly. I wanted it light and fresh since it is such a small room. I think one of the reasons I love it so much is that it is me and that I put it together with very little help from my husband... I believe he installed the chandelier that I painted and the curtain rod. Other than that, it was me and a whole bunch of paint! I was able to use colors and items that wouldn't fit in just anywhere else in our home. The only thing I think I would change about this room is the fact that it is carpeted. I have an area rug over the carpet to somewhat protect it. Eventually, we would love to put hardwood or a painted plank floor upstairs. Oh, and if it wasn't so messy most of the time!! Thanks so much Stefanie for letting me share my creative space! I love Michelle's blog and her lovely home! She has such a flair about her. Love! I would like to dig through the cubby bin on the wall. Sorry about the photos. Looks like Michele's site is having a problem with bandwidth today. So sorry guys! My hubby is fixing it asap! !